The origins of Britannia can be followed back to 1938 when it was agreed that the current yacht Victoria and Albet 111 was due for replacement. The Admiralty prepared a set of outline drawings for tender. The start of WW11 postponed the project until 1952 when the idea was revived and subsequently ordered from John Browns shipyard on the Clyde due to their expertise in constructing top class ships such as the Queens and the Coronia. The design specifications for the ship are impressive for she had to be capable of continuous operations in the Arctic and Tropical waters. She is capable of a continuous sea speed of 21 knots and has a range of 2,000 miles at full speed on a displacement of 4,715 tons. Two Steam turbines on each shaft provide a total of 12,000 h.p and in full speed burn 117 tons of fuel a day. Electrical power is provided by three 500 KW steam turbo generators and a single 270 KW diesel for harbor duties. The ships company comprises twenty one officers and 256 men and when on Royal duties a twenty six piece Royal Marine band. Within her design the utmost care has been taken in fine details, a few examples are, the funnel has been carefully shaped and fitted with internal filters plus the exhaust gas speed has been uprated to ensure that no soot falls on the decks. A flange is fitted around the top edge of the funnel to trap water and this is piped down inside to prevent the top of the funnel becoming stained. The funnel also acts as a derrick post for the two booms, To preserve the lines the eye plates hinge back into the casing when not in use and cover plates are fitted. Other fine points are the freeing ports/ bulwark doors are open at sea as required but can be closed when not in use to preserve the unbroken line of the bulwarks. The front of the bridge has been designed in a wind tunnel to prevent any strong wind eddies forming. Denny brown active fin stabilizers were a new feature at the time, the twin fins can reduce a roll of twenty degrees to six degrees at a speed of 17 knots. The ships engines are staggered at 10 r.p.m difference to help reduce vibrations Britannia, as can be expected is constructed to lloyds 100A1 standard following naval practice the platform deck is watertight throughout and the lower hull is divided by fifteen watertight bulkheads. To produce the immaculate finish on the hull the steel above the waterline is riveted but worked flush. Below the waterline the plate are lapped and the forward edges are faired with composition to reduce drag. The ship is designed to convert to a hospital ship in times of crisis, she can accommodate 200 patients within the spaces occupied by the Royal apartments. She was named and launched by Her Majesty The Queen on the 16th April 1953 as the previous ship of this name was King George V11s racing yacht which was scuttled on his death in 1936. The fate of Britannia at the present time is undecided although the Queen has expressed the wish that some future role be found for the ship rather than see her broken up. 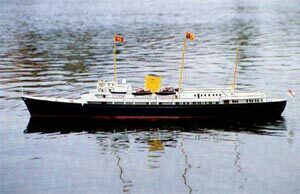 The model of Britannia is based on a fiber glass hull with bulwarks, portholes, proptube exits and bilge keels molded into the hull. The construction of the superstructure is from computer generated printed plastic in 1mm and .5m. To finish the assembly, vacuum formed pieces are provided for the funnel and all ships boats for those who wish to add lots of detail. Also included as an option are a complete set of the ships motor boat hulls with all detail molded into the castings to give two options for the model. To add the finishing touch, all fittings are included cast in light alloy or plastic. Brass etchings are supplied for the Ships stanchions and ladders. Prop tubes fitted with oiling tubes and stainless steel shafts are included together with a comprehensive instruction book to aid assembly with sketches and pictures to assist in the construction. All part numbers are keyed to the FULL SIZE PLAN included in the kit. Full details are supplied for the fitting of motors, nicads, and radio equipment.